KUALA LUMPUR: Sunrise Bhd plans to launch three new developments in the Klang Valley in the next few months, starting with the MK28 project comprising 460 condominiums in Mont’ Kiara in December, said executive chairman Tong Kooi Ong. Next in line will be the construction of two office towers at Jalan Sultan Ismail near the Renaissance Hotel here in January. Tong declined to elaborate on the third project. “MK28 will take about three years with units ranging from 2000 to 3000 sq ft and we have just finished the groundwork for the project,” he said yesterday after the company AGM. Tong said the commercial project at Jalan Sultan Ismail would take about four years. “The office towers, which will be over 30 stories high, will cater for the niche market and the net saleable area will be about 550,000 sq ft,” he said. The company had also ventured into Canada to develop residential and retail properties, he added, without elaborating. “We hope to launch the project (in Canada) by the middle of next year but this is subject to approval by the authorities. We are also looking at other countries in Asia for our overseas ventures but nothing has been firmed up,” Tong said. On the Government’s proposal to reimpose the 5% real property gains tax (RPGT) from Jan 1, Tong said it was not a bad idea as this would help curb speculative buying in the property industry. “The industry will like to see sustainable long-term growth and not a market bubble. We think the RPGT will prevent bubbles from building up in the property industry and we too believe that the RPGT will not affect our business,” he said. The company’s total unbilled sales stood at about RM860mil which will be realised over the next two years, Tong said. “We are also trying to achieve zero gearing in the future,” he said, adding that the company’s current debt level was about RM500mil. For its 2009 financial year ending June 30, Sunrise recorded RM804mil in sales and a net profit of RM156mil. In FY2008, Sunrise chalked up RM686mil in sales and a profit of RM160mil. SUNRISE Bhd plans to launch two new property projects worth some RM1.5 billion in Kuala Lumpur over the next four months. Executive chairman Tong Kooi Ong said Sunrise will launch 28 Mont' Kiara, a 41-storey tower featuring 460 units of condominiums, each ranging from 3,000 sq ft to 4,000 sq ft, this December. Early next year, it will launch Solaris KL, two 30-storey towers with 550,000 sq ft of office space on Jalan Sultan Ismail. Sunrise has done the foundation for 28 Mont' Kiara and hopes to start construction in December, completing it in three years. He said work on Solaris KL will start early 2010 and the project will be ready in four years. "We believe the market will do well next year. We are confident of sales because of the location and features of the properties," he said after a shareholders' meeting in Kuala Lumpur yesterday. Sunrise has applied to obtain the Green Mark certification for Solaris KL, which is issued by the Singapore government and awarded to buildings that are environmentally friendly. Its 11 Mont' Kiara is the first local residential project to receive the Green Mark. Solaris on the Park, a mixed development in Mont' Kiara, which is yet to be launched, has also won the Green Mark. Tong is optimistic Sunrise will do well with unbilled sales of RM860 million, which will underpin its earnings for the next two years to 2011. Most of the unbilled sales or sales that have yet to be booked into its accounts were from higher margin products in Mont' Kiara. Last year, Sunrise made a net profit of RM156.2 million on revenue of RM803.9 million. Among the projects Sunrise will launch in 2010 are Solaris on the Park, and a RM1 billion residential project in Richmond, Canada. Sunrise will launch a mixed development project on 0.6ha of prime land opposite the Petronas Twin Towers where Wisma Angkasa Raya now sits in 2011. "We have done a market study in terms of the various composition of properties, whether it would be a hotel, a condominium or an office block, with retail space. We have decided what we want. We are at the stage of appointing architects now," Tong said. The 24-storey Wisma Angkasa Raya, which is around 30 years old, is Kuala Lumpur's first high-rise office building. Sunrise paid RM179 million for land and property last year. The listing of TA Global Bhd on the main market of Bursa Malaysia on Nov 23, will position it as one of the largest listed property companies in Malaysia. TA Global launched its prospectus today for an Initial Public Offering (IPO) of 460 million shares at an issue price of 50 sen per share. The executive chairman of TA Global, Datuk Tiah Thee Kian said with the listing, the TA Group would be divided into two main business entities, namely the financial division under TA Enterprise Bhd and the property division under TA Global. "The property division will include hotel operations, property management, property investment and property development," Tiah said. He said TA Global which have three new Klang Valley projects with a gross development value of RM6 billion over a period of seven to 10 years and is now looking towards expansion in Australia and Canada. Shahril Ridza Ridzuan, currently group managing director of property group Malaysian Resources Corp Bhd, is poised to join the Employees Provident Fund (EPF) as its new chief investment officer (CIO). That position is now vacant after the EPF moved Johari Muid, its previous CIO, to be in charge of the pension fund's strategic planning unit early this year. "Shahril will probably join at the end of this year or early next year," said a source, who asked not to be named because he was not authorised to speak to the media. Shahril declined to comment when contacted. Currently, EPF chief executive officer Tan Sri Azlan Zainol is in charge of investments while the pension fund scouts for a new CIO. 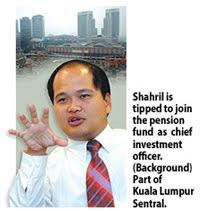 Shahril will help manage some RM354 billion at the EPF, one of the world's biggest pension funds. Last year, the fund paid out its lowest dividend in six years after the stock market fell 40 per cent as investors braced for a global recession. Things are looking up again for the EPF this year as the stock market has fully recovered the losses of 2008. The benchmark index is up 42 per cent so far this year. Shahril will join the EPF at a time when the fund is facing lower returns from its government bond investments, which make up about two-thirds of its portfolio. The Malaysian economy is also still weak and this could hamper dividend payouts. The economy is officially forecast to shrink 3 per cent this year and to grow 2-3 per cent next year. MRCB is the developer of Kuala Lumpur Sentral, a massive property project that comprises mainly office buildings, and the group is 30.97 per cent held by the EPF. Shahril's property background could be valuable for the EPF. The fund has expressed interest to buy a large piece of prime land in Sungai Buloh, Selangor, from the government to boost its property portfolio. It also wants to buy more commercial properties in Kuala Lumpur. Property developer Mah Sing Group Bhd has clarified that it is buying two plots of land worth a combined RM130.65 million in Selangor, and not as reported in yesterday’s article entitled “Mah Sing buys land worth RM927m”. The group said proceeds from the proposed private placement of up to 63 million new shares will be used for working capital.